Bahadurgad or the Fort of Pedgoan, is situated at the river bank of Bhima. It is still standing gloriously holding back the history along with it. 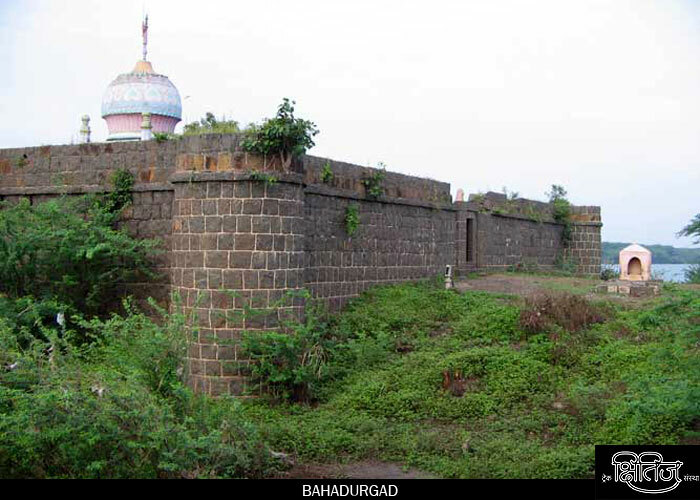 Bahadurgad is basically a land fort. It is situated in the base village itself. Many ruined structures are scattered in the village. There are two doors for the fort. One which opens in the village itself; which is still in a good condition, while the other is at the end of the fort. We should enter the fort from the village itself. As we enter we can see 5 feet tall statue of Maruti standing proudly as well as a temple of Bhairavnath. Special feature of the fort is, there is a group of 5 Temples which was built in Yadav period and the temple of Bhairavnath is one of them. But the temples are not maintained in good condition. Because of the coloring work done on the Bhairavnath temple, it has lost its structural beauty. In front of the temple many structures are seen like Virgal, Satigal, several Cannon Balls, a Deepmal and a statue of Shiva. Start along with the fencing. As you move forward you can see many devastated structures of , some of them are even hidden in shrubs. The fencing at the backside of the fort is ruined. From here you can see a view of Bhima river bank. A little further and you enter the fort. Here is a 2 storied palace of Aurangzeb. It is said that Aurangzeb and Sambhaji Raje meet at this palace. You need around 3 hours to see the fort completely. Then return from the same way. Before traveling back, you can see the Shiddhtek Temple, Rashin Temple and the Swinging Towers (Halte Manore). This fort is situated around 20kose away from Shreegondh village in Ahmednagar. This fort was built by Bahadurkhan in Pedgoan village. First you have to reach Daund Phata which is 90kms. away from Pune on Pune-Satara Highway. Just before Daund, there is a way to Shreegondh village. On the way you have to cross a bridge on Bhima river to reach Pedgoan village. It will take around four hours to reach Pedgoan village from Pune. Bhigavan village is situated on Pune-Satara Highway. From Bhigavan move towards Rasshin-Siddahtek road. Pedgoan village is 25km away from Rasshin village. Besides monsoon season, 15-20 people can accommodate themselves in the temple. Water facility is available in front of the Goddess Temple.